Home Edu Business News Shoppers Stop celebrates 26 Fashionable Years! Shoppers Stop celebrates 26 Fashionable Years! New Delhi: Your favourite fashion retailer Shoppers Stop celebrates its 26th anniversary today! And on this occasion, Shoppers Stop wants to celebrate YOU. Across its stores, Shoppers Stop will give customers the chance to personalize and customize select products purchased – So, create your own signature aroma with Soulflower, engrave your name on any Cross Pen, Create a customized monogram on any Ivy cushion cover & Spaces bath towel, & more! And that’s not all, there will be styling workshops, in-person make-up tutorials, makeovers and a host of exciting offers and giveaways in stores all through the week starting October 27th till November 12th. Launched in 1991, the country’s leading fashion retailer introduced the Indian consumer to a world-class shopping experience from its flagship store in Andheri (Mumbai). Over the years, Shoppers Stop has made many breakthroughs in the Indian fashion retail industry. Some of the driving factors behind its success are its strong loyalty base, superior brand assortment of nearly 400+ Indian and international brands, exclusive brand partnerships (Rheson, Wrogn, RS By Rocky Star, Femina Flaunt, Love Genration, Desigual), unparalleled customer service and iconic private brands (Stop, Life, Haute Curry, Kashish and Vettorio Fratini). 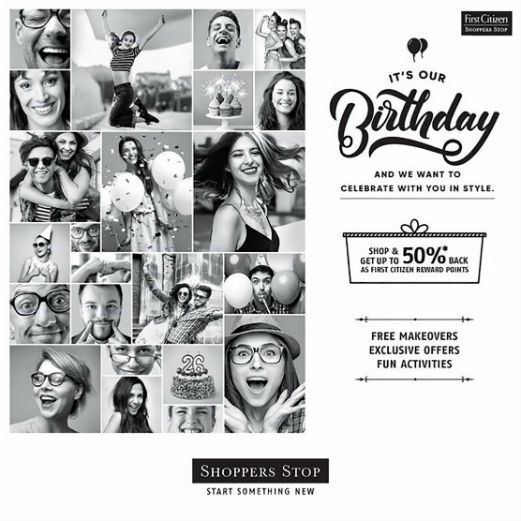 Today, Shoppers Stop has 81 stores across India, as well as an online store www.shoppersstop.com and mobile app iOS and Android. So, on the occasion of its 26th anniversary, show some love to the brand that revolutionized the way India shops!